"I'll miss u steve. You were my favorite person. You are my inspiration. Now I'm helping out at the local pet shelter because of you and I thank you. I love you. 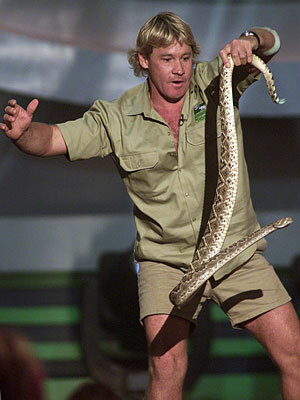 R.I.P"
steve irwin will be always remembered by the all wildlife lovers and many other people whose attitude has changed atleast to some extent towards nature and wildlife. He is the real role model for our generation and future ones. Steve i have always watched your show and can't belive that your gone i would have liked to meet u.
I'd never have the guts to hold something that big, but apparently Steve did!!!!!! !